After squeezing inside this 20-person Japanese restaurant in Neutral Bay you might hear a bit of Patsy Cline or Kenny Rogers drifting out from the kitchen along with the traditional ‘irasshaimase’ greeting. Chef Nagashima likes to prepare his sashimi to the sounds of the local country music station. He’s been making sushi in Sydney for over 20 years, originally at his popular stall in Hunter Connection food court, and now in his restaurant north of the Bridge. Ducking through the traditional Japanese curtains at the front door, you’ll leave behind the noise of busy Military Road, settle in at one of the small blond wooden tables, and get ready to eat. The specialty of Komaru is hako sushi, and this is one of the few places in Sydney to get it. 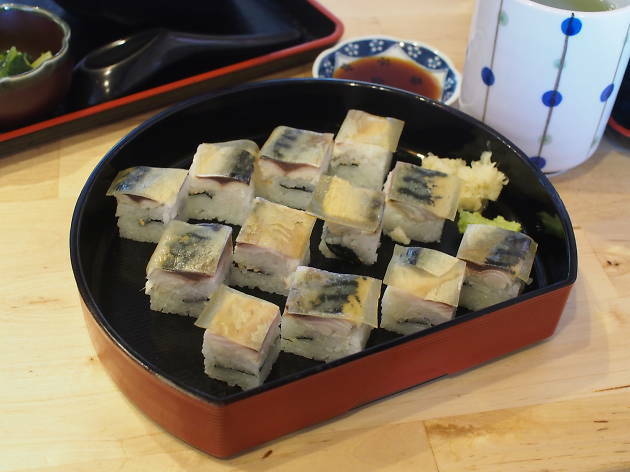 Hako sushi was created in Osaka during the Meiji era as a different way of preparing raw fish and sumeshi (vinegared rice). The fish, usually mackerel, is sliced thinly and layered alternately with vinegared rice inside a wooden box and then compressed with a lid. It’s cut into bite-size cubes and laid out on a lacquered tray so that the striped layers are visible. Pour soy into a little dish, mix in your preferred heat level of wasabi and then dip, fish side down. It’s even OK to use your fingers to pick up the cubes. The shiny, silver-skinned mackerel is the traditional fish of choice (the vinegar balances out its strong oily ocean fish flavour) but you can order it with bright pink salmon as a pretty, and milder flavoured alternative. For a different sashimi combo, order the chirashi, a meal in a bowl and a specialty of the chef. Rice is flavoured with a little sweet vinegar and topped with prawns, slivers of kingfish, tuna, salmon and bright red beads of flying fish roe. The fish is layered over the rice in neat circular rows, with small shreds of omelette and some bright green steamed spinach. Got a monster hunger? There are super-sized bowls on Tuesdays and Wednesdays for only a couple of dollars more. The set lunch specials bring Japanese homestyle cooking to Neutral Bay. This is seasonal cooking, where the featured dish at the centre of the lacquered tray in winter might be softly braised pork in soy sauce, ‘wings’ and meaty fish segments cooked with chunks of daikon radish until they fall off the bone. In summer, lighter udon noodles in a dashi and miso broth might be the star of the show. Rice and a small salad topped with a few choice slices of salmon and tuna sashimi sit along the side with a pageant of oft-ignored veg like thinly sliced celery tops or neatly bundled spinach stems, lightly steamed and dressed in a little mirin (sweet sake), soy and sesame seeds. At night, the menu changes over to blackboard specials, where you can mix and match your own dinner combo. Oysters, fried or fresh in the shell with a splash of salty citrus ponzu sauce, can be ordered individually. The availability of market fish dictates the menu, but there’s usually pale pink and sweet hiramasa kingfish, lightly flavoured cuttlefish and the occasional smoky eel. Hamaguri sakamushi is a cold weather favourite, a soup of tiny shell-on clams in a sake and fish flavoured broth, given extra lush creaminess by a touch of butter. Sliced eggplant is spread with miso mixed with ponzu and grilled until the miso mix caramelises. Dinner combo sets contain crisp skinned grilled mackerel or salmon served with palate-cleansing grated daikon, fried karaage style chicken or hot, battered, crisp octopus, and more chirashi bowls, at least 15 on our count. And did we mention it’s BYO for $3 a head? The menu at Komaru has a hint of a small-town Japan to it, mixed with the bright city lights of modern dining. It’s homestyle cooking with a country music soundtrack made with skill and precision, and you can only get it in Neutral Bay.